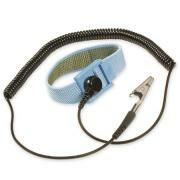 Detailed listing of our ESD Supplies and Equipment. Portable ESD Protection from 3M. This name brand kit includes everything necessary to create an ESD safe workstation where ever you are. 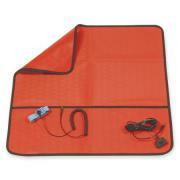 Kit contains 22"x 24" heavy duty static-dissipative mat with storage pockets, a wrist strap with 10 ' coiled cord and a 5 ' ground cord assembly with snap. Both ends of ground cord are protected by a 1 Megohm resistor. 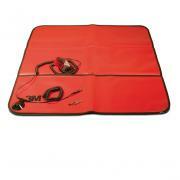 This work mat is easily folded and light weight, a perfect addition to any tool kit. Budget friendly ESD protection. When the budget constraints don 't allow the use of top-line anti-static devices, this is the best alternative. Included in this kit is a 15� straight ground cord a with two alligator clips, wrist strap with 6 ' coil cord and banana plug and a 24" x 24" anti-static mat with pockets. Wrist strap cord also has a 1 Megohm resistor for safety. Affordable protection against ESD. Adjustable, comfortable fabric band has conductive strands woven into the skin side of the strap to ensure proper conductivity. 8-foot coil cord has 1 Megohm resistor and universal banana plug and an alligator clip. For use with ESD Floor Mats and ESD Flooring. 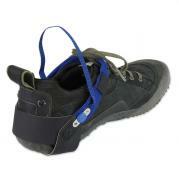 This reusable foot grounder provides continuous grounding to the ESD floor or mats. Wide elastic back keeps the heel strap in proper position and the high visibility red color shows the supervisor you are in compliance. 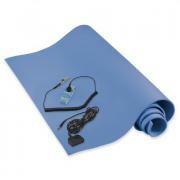 Features 18 inch long conductive ribbon and 1 Megohm resistor. This dual purpose ESD grounding plug and outlet tester provides a simple, reliable and safe ESD grounding point using a verified and tested outlet. 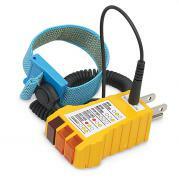 This dual-purpose ESD Grounding Plug and Outlet Tester replaces expensive electrical ground circuit testers and indicators with a simple, convenient, cost-effective means to connect vital ESD equipment to grounded electrical outlets. Simply test the outlet briefly using the tester's LED indicator lights then, once correct wiring is confirmed, plug the ground cord of your ESD Wrist strap, ESD workstation, field service mat, wrist strap tester, or other ESD instruments into a verified facility electrical ground. NOTE: Shown with optional ESD Wrist strap, not included. #40170 Wrist Strap sold separately. Large 2' x 4' work area is perfect for bench technicians. This popular kit is just the right size for the service bench. It features a .080" x 2' x 4' three layer static dissipative ESD mat that is resistant to solder splashes. Kit comes complete with ESD mat, ESD wrist strap with 6' coil cord (wrist strap cord has a 1 Megohm resistor for safety) and a 15' ground cord. Ideal for bench service technicians working on sensitive equipment. Less restrictive than wrist straps. An important part of your ESD program, ESD floor mats provide a safe way to discharge static buildup. This 3M ESD Floor Mat has a unique 3-layer construction. Top Layer: Durable static-dissipative vinyl which has sufficiently low resistivity to discharge static-laden conductors. Middle Layer: Highly conductive scrim that provides the main discharge path to ground. Bottom Layer: Static-dissipative foam, a durable non-skid cushion. 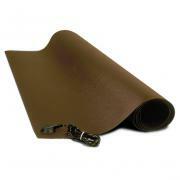 4' x 6' mat includes 15-ft. ground cord and 2 snaps.